To carry on these life saving efforts for our dogs, we are asking for all of you to help us, once again, in a unique and special way by becoming a CORE member of the National Canine Cancer Foundation. To become a CORE member of the NCCF, we are asking our supporters to commit to donating a minimum of $10 per month for at least one year. You can donate more monthly and you can extend it for longer than a year if you’d like. Knowing that we have a monthly base of donations allows the NCCF to plan ahead in our commitments to new research grants. Our CORE members will have a powerful impact on moving research from the lab to the dog patient. 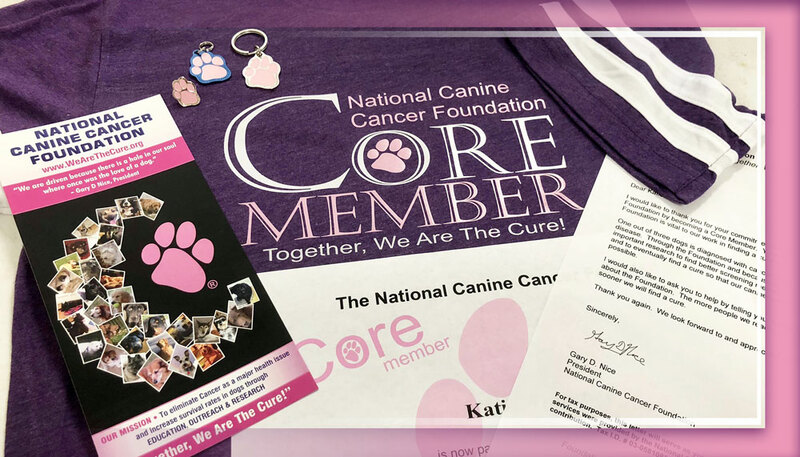 Once you sign up as a CORE member of the NCCF, you will receive 3 of our Exclusive Pink Paw products, an exclusive CORE membership T-Shirt, a special membership certificate, and your name will be listed on the site as a CORE member. Additionally in the future, CORE members will have access to other exclusive membership opportunities as they become available. If we all work together, WE ARE THE CURE. There are 2 ways to sign up as a Core Member through the foundation. First option is through the link below. This will take you directly to paypal to set up a monthly donation. Second option if you do not have paypal is to contact our store manager directly at 866-262-0542 or by email at ordersnccf@gmail.com. Kelly will guide you through the process and answer any questions you may have.